I hope everyone had a good Mother’s Day, or just a good Sunday. This is Part Three of the series about the EF-5 tornado that went through central Mississippi on April 27, 2011. Part One and Part Two are linked. Days later, after the terrible human toll becomes widely known, the scientific damage surveys come in. I’d been keeping an eye on them, not really expecting this storm to be high on the priority list because there were fatalities in other areas such as Smithville (it is not known at the time that “my” storm was the same tornado that killed 3 women in Kemper County), but knowing that eventually it would be examined. One day, the piece of news I have been interested in for personal reasons comes in; the tornado has been rated EF-4 with 180 mph winds. It began around Philadelphia and lifted outside of Mashulaville. 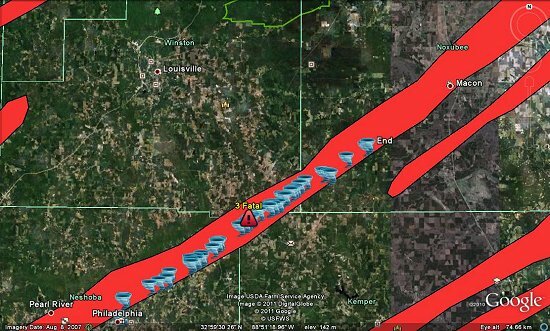 The Jackson office of the Weather Service helpfully put a Google Earth file on their website that showed the tracks of the tornado and the supercell that spawned it; I download this file and look at it. The mesocyclone—the strongly rotating column within the thunderstorm—did indeed pass directly over my house. The tornado itself would have continued straight into downtown Macon if it had stayed on the ground, most likely missing my house, though barely. This fits with what I heard the day it happened, but now I know just how bad it really could have been for the town. Like, I suspect, a great many people in the South, I have graphic nightmares about the outbreak for several days. When some comparatively mild thunderstorms come through a few days later, my nerves treacherously ignore what my meteorology-educated mind is saying, that there is nothing to worry about except lightning. I dare not suggest that I have post-traumatic stress disorder when I did not actually experience a life-threatening trauma, or when so many who experienced the tornadoes directly undoubtedly do now suffer with this condition, but everything must have degrees, and I am clearly experiencing some degree of being traumatized. It’s hard not to experience something like this when you leave home with the completely justified expectation that you won’t be coming back except to ruins, even when that turns out not to be the case. In addition, there is the knowledge of what might have been, with a significant helping of meteorological education and a vivid reading-influenced imagination thrown in for good measure. There is knowing that the tornado I had run from was every bit as bad as some of the worst beasts of the outbreak—except that it did not last long enough to make a direct hit on a closely populated site. And then a week after the outbreak, the tornado’s rating is changed to EF-5, the highest on the scale. This is the kind of tornado that leaves slab foundations swept clean, the kind that reduces every smallish building in its path to rubble, the kind that obliterates small towns. In the case of this specific tornado, it’s the kind that, by the force of the wind and probably some microscale debris, pulls up blades of grass and digs out sections of the ground two feet deep. I recall reading a comment by some meteorologist, I have no idea whom, to the effect that he would not believe an F6 tornado could exist (this was in the days when the old Fujita Scale was used) until he saw coffins pulled out of the ground. Well, there is no such thing as an EF-6, and “F6” was never put into practice because there were no official damage criteria for it, but four more feet and this one would have been capable of that one man’s stated standard. And yet I think the Hackleburg/rural Alabama EF-5 was still more violent. The damage survey for that one is responsible for one of my nightmares. Three women in Kemper County, MS lost their lives in this tornado that I ran from. They lived in a mobile home. There were surely others in the South who tried to take shelter in these structures and did not survive. Trailers are not safe! Granted, little will stand up to an EF-4 or EF-5, but a trailer won’t even stand up to an EF-2. And there are a lot more of those than the 4s and 5s. The Weather Service guideline of leaving a trailer is spot-on. And even a constructed house isn’t necessarily safe, though the type of tornado that would create uncertainty about survival in these structures is mercifully rare. However, such tornadoes do happen. They happened that day in April. I wish that more people and communities in the South had storm shelters—and underground ones. Above-ground concrete bunkers may be all well and good, but houses in the Hackleburg and Phil Campbell area had their concrete block foundations destroyed by the EF-5 that went through there. Also, something capable of digging up dirt two feet deep is quite possibly capable of undermining a slab foundation by the same process and ripping it from the ground by an extreme wind-tunnel effect under the now hollow space. (That would be beyond anything I have ever read about, but the possibility has been theorized, and this is how it would happen.) Anyone who can afford it should build a storm cellar—and it bothers me that more people in this region cannot afford it. There should be a tax credit for it. I have never left the house before over a tornado warning, or even a suspected tornado. This was a decision that I made based on the information that was available to me at the time: my knowledge of the off-the-charts atmospheric parameters that supported violent tornado formation, my experience driving in supercells, the extremely threatening hooked radar signature, the probable debris ball that is usually seen only in intense tornadoes, the path that would have taken it almost directly over my house, and the report from chasers and spotters of a confirmed large tornado with damage and debris. I decided that the probability of this being a tornado that my house could not stand up to was unacceptably high. It turned out that the tornado that I fled from was an EF-5, which seemingly justifies the action, and yet I can’t endorse the choice I made as a general public rule. It happened to be a good decision based on the fact that I had time and I knew what direction to drive, but in general it is a risky decision, and risky decisions should be made only if there is extensive knowledge to support them. Blind, panicked “I have to get out of here and it doesn’t matter where I go” driving is not something we need. Anyone who doubts this should take a good look at some of the damage pictures that involve vehicles. As a matter of fact, extreme vehicular damage was one of the criteria that the Jackson NWS office used to upgrade “my” tornado to EF-5. Smithville, MS. Hackleburg, Phil Campbell, Rainsville, Oak Ridge, and so many other small towns in Alabama. Tuscaloosa and Pleasant Grove, AL. Ringgold, GA. And almost, but for the grace of God, Macon, MS. The nonchalance that at least some people seemingly had comes back to my mind. I hope it was the exception. I hope that, after seeing what happened to their neighbors in small towns just like Macon, they are reflecting on their own close call. Do they know what a close call they had? Do they realize just how out-of-the-ordinary the tornado that was barreling straight for them truly was? Do they realize that, if the tornado had not lifted, there would probably be another small town on the dreadful list of “leveled by an EF-5 tornado”? And yet, there are so many uncertainties. Would the tornado have maintained that strength if it had stayed on the ground? Sometimes they don’t. Or would it possibly have strengthened even more, as the horrific rural Alabama EF-5 apparently did as it tracked north? No one can know. But we can make sure that, if something like this should happen again in our lifetimes, we have a plan of action. This is Part Two of a series of three about my experience with the EF-5 tornado that went through four counties in Mississippi on April 27, 2011. Part One can be found here, and Part Three, an account of the aftermath, will be forthcoming. “I’ll call after it passes,” he says. His voice is clearly nervous. We hang up. I take another look at the radar that the weatherman is talking about. That sure looks like a debris ball, I think, as the menacing supercell enters southwestern Noxubee County. Then bzzzzz! The phone buzzes again. This time it is one of my sisters. “Does that look like a debris ball on radar to you?” She says that it does. “All right,” I say, arriving at a decision instantly, as the crawl-space foundation of this old house flashes before my mind’s eye. “I’m getting the cat and getting out of here.” She agrees. The tornado safety guidelines put out by the National Weather Service do not endorse leaving a house in a vehicle. I understand why. In general, a house can be regarded as a comparatively safe place to be in a tornado, whereas a vehicle cannot. Moreover, it’s possible to get on the road and drive directly into a different tornado or an area of high winds. When I tell my sister that I’m planning to leave, I know full well that I am going against this advice, and for all these reasons, I don’t recommend that to people in general—certainly not when there is not even a confirmed tornado, and in most cases, not even when there is one. However, as a meteorology student, I have closely monitored the extreme atmospheric conditions that would be in play for this event. I am aware that, under these circumstances, tornadoes that form are far more likely than normal to become “violent”—to reach an intensity at which even well-constructed homes are definitely not safe to be in because every wall in them is blown down. I am aware of what to expect if I choose to drive through the precipitating part of a supercell. (I was close to the wall cloud of one a week ago, after all!) I am aware that there is a clear spot north of Noxubee County, and there is nothing that will enter that area in the immediate future. And, most importantly, I have enough time to get away. But only just enough. There is no time to lose. The storm is moving quickly, and at the angle it’s coming, it will be upon me in 20 minutes. I grab my laptop, leaving behind even the power cords. I reflect for a moment on the irony of this; I had recently seen my first AC adapter go out and had to get this one over the Internet. Well, there is no time to waste by crawling under my desk and unplugging the cord. I grab my purse. I shove my protesting cat into the cat carrier. Carrying only these things, I run into the vehicle, hoping that the lightly falling rain does not penetrate the laptop case, and apparently (so I discover later) leave a rut in the yard in my rush to get out of there. I head north. I would not leave my cat at home, but the delay in grabbing up these things has cost me a few more minutes. Meanwhile, the tornado has not waited. It’s best not to say what speed I am driving, but no one else heading north is driving any differently. I wonder how many of them are on the road for the same reason that I am. The rain slacks off. I never run into any hail on this trip. It is between Macon and Brooksville that I start seeing small pieces of branches fall from the sky. They are not large enough to slam to Earth with violence, so there is something almost graceful in it. I’ve never seen anything like this before. These are not being blown about horizontally by winds; they are falling like soft rain from the storm itself. The movement is vertical. The branches have been sucked into the mesocyclone, which tilts southwest to northeast; the part of the storm that I am under is nowhere close to the tornado! Seeing debris brings everything to mind that I have pushed out in my single-minded focus on getting away. It occurs to me that people somewhere may see debris from my house later on. Well, I’m safe, and the cat is safe, I think to myself. There’s nothing more I can do. Almost mockingly, the sunlight breaks out as I leave Noxubee County. I hear the buzzing of my phone once more. It is my father, who has tried to call me several times since my sister called him and told him that I had decided to leave the house. “You’re fine in that part of Lowndes County,” my father tells me over the phone. That fits with what I had seen on the radar; I knew that there was a dangerous supercell in Monroe County (the Smithville tornado, it turned out). I also know that, though nothing tornadic is coming for Starkville and Columbus at the time, I do not want to be stuck in one of these cities if that changed in an hour or so, as it often does during tornado outbreaks. I also don’t like the idea of pulling off the road indefinitely. I decide to stop at the house of friends in rural Lowndes County, and there I stay for an hour or so. I am fully expecting that I will not have a house to go back to, or my house will be damaged beyond repair, or the town will be destroyed. I’ve read a lot of personal accounts of extreme weather events, and now it seems that I am about to live that awful aftermath. It is truly amazing how we are able to push thoughts like this out of our minds when we are focused on something critical, such as (possibly) survival itself. Now that this is not an imminent concern, the ugly realities of a tornadic strike hit me. I don’t know exactly what will be damaged, or how much, but there is absolutely nothing I can do about it. All I can do is wait to hear some news. It is a hideous wait, and yet, I am focusing more on the animal confined in her carrier next to me, and the fact that no one else was at home, than on the home itself. No one wants to lose a house, but when all is said and done, it’s just a house. Over the course of my visit, my hosts learn that Macon has not been hit. The storm apparently passed over with rotation still apparent, but no tornado anymore. To my astonishment, there was apparently some nonchalance about the whole event in at least some parts of Macon. Finally I decide to return home, since I still indeed have one. I get there in time to settle in and watch with amazed horror as live footage of the tornado in Tuscaloosa airs. Later, I see video of the Noxubee County tornado. I find out through the TV news and Twitter—Macon, amazingly, has power—that many people in the Southeast are not so fortunate as I have been this afternoon. My own experience is pushed back to a different corner of my mind as the hideous extent of the destruction and suffering becomes known. I have not suffered loss. I focus on those who have.